Charles Fenwick was but one of many Englishmen, who in the 1700s settled in Helsingør in order to profit from the town´s lively trade, generated by the many ships which anchored to pay Øresundstolden – the duty imposed for sailing through the Sound on which Helsingør was located. As an Englishman, he ran into a problem of loyalty when his countrymen in 1801 and again in 1807, sent a large fleet through the Sound to do battle with his adopted country. As fate would have it, one of the English cannonballs hit his own farm. The Fenwick family was but one of the many foreign families, who in the era of shipping duties on the Sound settled in Helsingør to pursue their livelihood there. Many other English, Dutch, French, Jewish, and Swedish families moved to Helsingør, which to a high degree had need of newcomers, after a series of misfortunes had hit the town; several plague epidemics, the long occupation of Kronborg Castle during the Swedish Wars, and the Great Northern War with its serious consequences, among others the breakout of bubonic plague, which cost a third of the town´s citizens their lives. It was first long after 1720 that sea trade bloomed again, and the long period of stagnation showed clearly that sea trade was necessary for the town to prosper. The population had fallen drastically, and many lived on poor-relief. The shipping duty that Erik of Pomerania, in 1492, had ordered on all passing vessels, forced the ships to lay anchor outside Helsingør at the anchoring-reef (correct maritime term in English is –roadstead-) for an average of a whole day, to declare goods, fill out documents attesting to their cargo’s value, pay duty and harbour taxes. After many years of protests of varying degree, especially from the Dutch and English, USA forced the Danes to accept an alternative to the long-standing shipping duty, in return for a substantial compensation. This agreement became effectual on the 14th of March, 1857. It was to this town, in 1725, that David Fenwick came from Stockholm in his capacity of diplomat and commissioner for a Trading House in London. His son, Nicolas Fenwick, was appointed British Consul General in Denmark, and made substantial amounts of money through sea trade and as a shipbroker, but absolutely refused to pay taxes or make other contributions towards the military quartering that was a serious economic burden on the town. He invoked his position as diplomat as grounds for immunity with regard to taxes, and for not seeking admission into the Traders´ Guild. The irritation felt by the town´s inhabitants was not lessened by his extremely arrogant and haughty British manner. 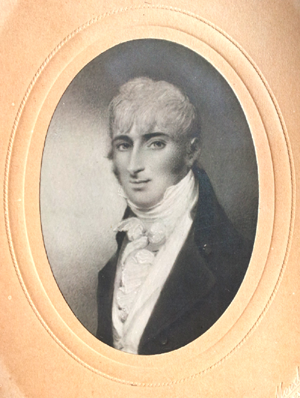 Following Nicolas’s death, his position as Consul General was taken over by his son Charles (1775-1832), who also continued the family business ventures from their property on Strandgade 85-87 (85-87 Beach Street). His popularity does not seem to have been greater than his father’s and perhaps the town´s inhabitants saw it as no coincidence when, as the English Navy headed through the Sounds of the Øresund, one of the cannon-balls fired at Kronborg Castle by Admiral Parker’s fleet hit the Fenwick property. At this time, an atmosphere of strong national division had arisen in Helsingør, and the insults and indignities which English captains and officers were constantly subjected to, caused Charles Fenwick to repeatedly lodge complaints with the Magistrate, who consistently rejected the charges. 17 English citizens felt so threatened by the situation, that they requested alternative housing outside the town, in case the situation developed into open hostilities between Denmark and England. Politically, Europe was in a very unstable situation because of the enmity and hostility that prevailed between England and France and which so far had culminated with the French fleet being destroyed by Lord Nelson at the Battle of Abukir in 1799. Denmark remained neutral and as a security measure, trading ships sailed in convoys to prevent being stopped and searched by English vessels. With good reason, the English had a strong interest as to whether the ships were carrying contraband. After a few unfortunate episodes between Danish and English vessels, the Danish government decided to enter into an armed neutrality pact with Sweden and Russia, a decision which the English could only interpret as a turning against them. This decision plus a series of dramatic events in the following few years had catastrophic consequences for the neutral Denmark-Norway and were the background for Charles Fenwick’s actions in support of England. At the end of March 1801, Admiral Parker’s fleet sailed through Øresund and anchored just outside Copenhagen. On Maundy Thursday (day before Long Friday) the 2nd April, the famous battle, Slaget på Redden (The Battle of the Anchoring-reef) was fought, which the English second-in-command, Lord Nelson, after many hours of fighting succeeded in bringing to a successful conclusion with the help of the famous subterfuge which convinced the Danish Crown Prince to agree to a truce. Denmark committed itself to withdrawing from the armed neutrality pact for at least 14 weeks. In the course of the following years, England became more and more isolated in its battle against France, where Napoleon was at the height of his powers. Denmark, with typical optimism, trusted the fact that, with one of the continent’s strongest navies, they would be able to keep themselves out of the final showdown between the arch-rivals. It was to turn out quite differently. In 1807, talentless English diplomacy, mutual misunderstandings, and the Danish Crown prince’s stubbornness and willfulness, ended with the siege and bombardment of Copenhagen and the loss of the Danish fleet, a national catastrophe which left a deep mark on the nation for many years. With the loss of their proud Navy, the time of flourishing trade ceased, the flow of money to Copenhagen ebbed out, and ended in 1813 with national bankruptcy. Denmark entered an unhappy alliance with Napoleon, and the fight against England continued with the few resources Denmark still possessed. After 1807, Charles Fenwick was no longer able to remain in Helsingør, and took up residence in Helsingborg (across the Øresund on the Swedish coast). From here he continued his business ventures in Helsingør through a front-man. It was first after Napoleon’s fall in 1814, that he returned to Helsingør. “The unexpected break with Denmark in 1807 forced me to again move from here. As a result, I moved my office to Helsingborg, where I received orders from Mr. Pierrepont to remain and continue the duties of my Office. From that time, right up to 1814, when I again took up my position in this country, I never ceased, even through those difficult times, to carry out my official functions from Helsingborg and its surrounding areas. In this period, I diligently and energetically used all the resources at my disposal in the service of His Majesty, either personally, or through agents I had recruited. I gave advice and information regarding the enemy’s grasp, to those of our trading ships which put to in the southern Swedish harbours, and warned them against continuing unless in convoy. Through a continuous exchange of letters with His Majesty’s Consul in Góteborg containing the first line of information about what was taking place in Denmark and beyond the Sounds and Belts, I was instrumental in the early sailing of His majesty’s squadron, under Captain Parker, from Góteborg. A part of this squadron sailed to the Belt and a part to the entrance to the Sound, forcing not only General Bernadotte to retreat with his staff from Seeland to Fúnen, but lead also, in 1808, to the capture of the Danish 14-cannon ship Prince Christian Frederik. When Captain Parker had reached the waters off Kullen, I was the first who procured him the information that the Danish warship had escaped a few hours earlier, heading towards the Belt, where-after he sought after her in those waters. During the whole of my residence in Sweden, I diligently reported details of all events that occurred, and any information that came to my attention, to His Majesty’s ministers and envoys, and continued a confidential exchange of letters, not only with the respective Commanders-in-Chief of His Majesty’s Baltic Fleet, but also with those Admirals and other officers who had command of the separate squadrons, and thus kept them informed of everything which I knew to be of value in the service of His majesty and detrimental to the enemy. It is evident from the existing letters that, since the end of the 17th Century, Charles Fenwick had been in constant contact with a long line of his countrymen, changing British ambassadors in Stockholm, a Mr. Burridge in St. Petersborg, a Captain Dashwood, who for a time had the job of guarding the island of Anholt, as well as many others. One of these reports, at the end of 1812, a rumor that French troops had entered Moscow, and expresses the hope that the rumor is false. The letters are to be found on film in the Danish National Archive, Rigsarkivet. The cessation of hostilities in 1814 made it possible for Fenwick to return to Helsingør. One can speculate over what the Danish citizens´ attitude was in regard to the English in the light of the series of misfortunes that had struck the country in the intervening years. Already in 1815, Charles Fenwick bought, from his mother, a half-timbered farm property in Nyrup, which his father had purchased in 1795. Nicolas Fenwick had taken it over from the smallholder Christian Olsen, who, 5 yrs earlier had secured smallholder lot nr.3 from an area subdivided from crown lands. Nyrup is mentioned for the first time in 1178 and was developed as a settlement around 1788. The farm building was originally half-timbered with a three-winged farm-yard. In Nicolas Fenwick’s time, the farm was extended with the purchasing of neighbouring acres and Nyrup Lake. After Charles Fenwick took over the property, further land areas were purchased, from Svingelgården (the Svingel Farm) and Søelyst. From 1820-1824, he completely rebuilt the house. In 1820, a new living-room was built, which, with its English windows and the tall roof with red Dutch tiles took on a new look and character. Further extensions followed with time, and in 1822, a new house, which he named “Claythorpe”, was built elsewhere on the property, on the other side of Nyrup Lake. This house was built for his son, and its present appearance is due to extensions and re-modelling by later owners. Fenwick named his own farm Fairyhill, and the main building, with the original English windows, still maintains its English air and atmosphere. The building method used on the two properties was a well-known method from Southern England and Wales using stamped clay, known as pise de terre. In England such houses are known as cob-houses. There are innumerable houses built by this method still to be found on Seeland, and the youngest example is the twin houses from 1928, situated in the old Husum village. Many other English families bought or built country properties in the district, and the Scottish family of Brown, refugees from the Reformation, and supporters of the Stuart line, purchased Gurrehus, which like Fairyhill was originally a half-timbered farmhouse. The Browns were in residence a great part of the year, and established a close friendship, and later familial relationship to the Fenwicks when Charles Fenwick’s second son, George Thomas, married Edward Brown’s daughter, Melior, in 1835. Edward Brown was very pleased with his son-in-law, and with great care, furnished and decorated the young couple’s home at Claythorpe. A couple of years later he suffered a large economic loss following the bankruptcy of the Indian trading firm, Fergussons, where a considerable amount of his assets were invested. He decided therefore, to emigrate to Australia to try his luck there. Many other members of the Brown family made the journey, including the young couple, Brown’s daughter Melior and his son-in-law George Thomas Fenwick. Altogether, the party consisted of 33 people, including servants and their own doctor. In 1806, Charles Fenwick had married Susanne Johanne Berner, the union being certified by the British Envoy in Copenhagen, Garlike. The marriage produced three sons; Nicolas, George Thomas, and Fairfax. George Thomas and Fairfax emigrated, and Nicolas’s fate is not known. In 1827 and 1828 the family is touched by two unhappy events. Charles´ sister Elizabeth dies, leaving heirs not yet of legal age, and her oldest son Manning Rogers dies under unusual circumstances a year later. In 1829 Hester Fenwick (Charles Fenwick’s mother) dies and a long and complicated inheritance process began. The division of the estate can be found the national archive for Seeland. (Landsarkivet for Sjælland). The case documents reveal that the deceased, through the years, had been generous to her closet relatives; her meticulous bookkeeping is signed by Charles Fenwick, whilst her capital was administered by Messrs. Goslings and Sharpe. In 1826, Charles Fenwick received a letter granting him 1000 pd. Sterling as a special gift, and very carefully specifying that this amount was to be kept separate from the coming division of the estate. After his mother’s death, Fenwick seeks permission to register and seal her property, until it is decided according to what set of rules the case is to be treated, according to Danish law, or according to the agreements made between Denmark and England in such matters. The executor is the Attorney of the High Court (Landsoverretsprokurator), F.W. Qvistgaard, who works on the case for the next two years. In Sept. 1831, the case is concluded in a final meeting in the Probate Court in Helsingør. Prior to this, a veritable stream of letters have been sent to the Probate Court, the State Department, and Mayor Stenfeldt. As is so often seen in such inheritance cases, disagreements rose at an early stage among family members, as to the division of the estate. Charles Fenwick passes away in 1832. His widow, Susanne Berner remains in Fairyhill until, from economic necessity, she sells the property in 1840. Thus, Charles Fenwick’s life’s work passes out of the family, and the farm has a chequered existence, with many changes of ownership and several foreclosures, until, in 1919, it is sold to the Krabbe family. 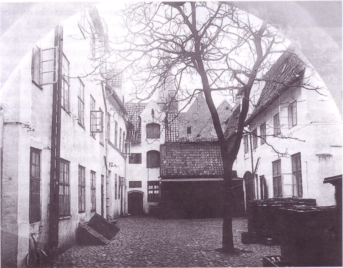 the photographer stood in the gateway to the front building facing the street, and pointed his lens towards the cobbled yard, which is flanked by late mediaeval houses. In the front building, Nicolas Fenwick, and later his son Charles, had their private residence, and it is thought that they used, at least, the house on the eastern side as a warehouse. The building at the rear was likewise a warehouse, and here we can see the iron beam for the pulley system for the warehouse’s upper floors. In the background, the spire of St. Olai´s Church can be seen. Today, in spite of thorough restoration work on all the buildings in the 1980s, there are no major changes. Beneath the present residents thriving flower gardens, the time-worn cobblestones can still be found, and over the gateway, the cannonball which hit the property in 1801 is still to be seen. The cannonball from one of the ships in Admiral Parker’s fleet, which by strange coincidence hit Fenwick’s property, is, by all accounts this one, which is plastered into the brickwork of the gateway to Strandgade 85-87, and with now faded paint records the date of the event. 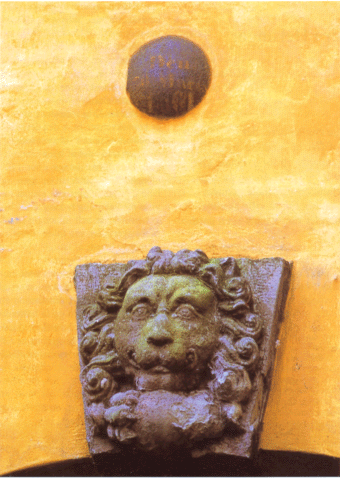 The lion’s head underneath, which is the gate’s renaissance-decorated key-stone, bears witness to the fact that Fenwick’s property pre-dates this time. 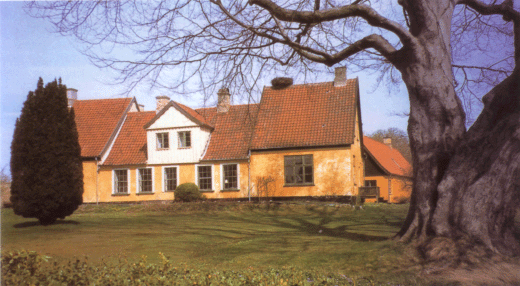 In 1820-24, Charles Fenwick had his farm in Nyrup rebuilt. He named it Fairyhill. Here we see the beautiful building from the garden, where, in Fenwick’s time, one had a view of Nyrup Lake, which has since dried up. Original portraits of Charles Fenwick and his wife, Susanne Johanne have not been found, but there are a pair of older reproductions hanging at Fairyhill which somewhat make up for the fact. Kindly made available by Erling Krabbe, Fairyhill.